The research was led by Rowan Martindale, an assistant professor at The University of Texas at Austin Jackson School of Geosciences, and published in print in Palaeogeography, Palaeoclimatology, Palaeoeconology on July 15. The study was co-authored by Martin Aberhan, a curator at the Institute for Evolution and Biodiversity Science at the Natural History Museum in Berlin, Germany. The study zeroes in on a recently discovered fossil site in Canada located at Ya Ha Tinda Ranch near Banff National Park in southwest Alberta. 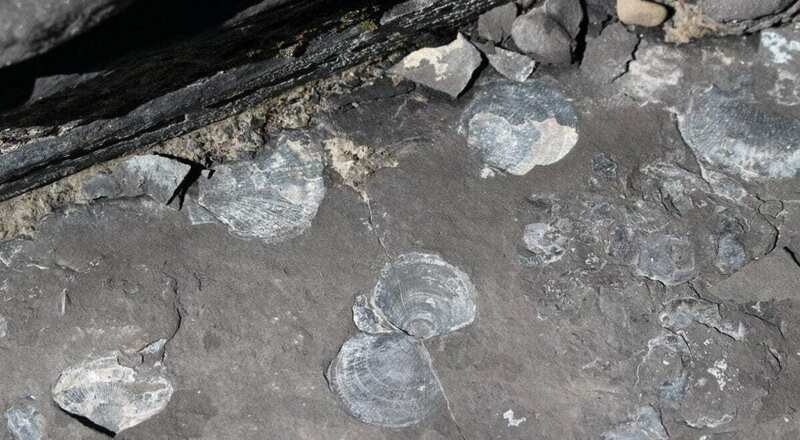 The site records fossils of organisms that lived about 183 million years ago during the Early Jurassic in a shallow sea that once covered the region. The fossil site broadens the scientific record of the Toarcian Oceanic Anoxic Event, a period of low oxygen in shallow ocean waters which is hypothesized to be triggered by massive volcanic eruptions. The Oceanic Anoxic Event was identified at this site by the geochemical record preserved in the rocks. These geochemical data were collected in a previous research project led by Benjamin Gill and Theodore Them of Virginia Tech. The oxygen level of the surrounding environment during the Early Jurassic influences the type and amount of carbon preserved in rocks, making the geochemical record an important method for tracking an anoxic event. The fossils show that before the anoxic event, the Ya Ha Tinda marine community was diverse, and included fish, ichthyosaurs (extinct marine reptiles that looked like dolphins), sea lilies, lobsters, clams and oysters, ammonites, and coleoids (squid-like octopods). During the anoxic event the community collapsed, restructured, and the organisms living in it shrunk. The clams that were most abundant in the community before the anoxic event were completely wiped out and replaced by different species. The clams that survived during and after the event were much smaller than the clams from before the event, suggesting that low oxygen levels limited their growth. The sea life recorded at Ya Ha Tinda before and during the anoxic event is similar to fossils found at European sites. Crispin Little, a senior lecturer in paleontology at The University of Leeds who was not involved with the research, said that the similarity between the sites underscores the widespread nature of the anoxic event. “This confirms previous work suggesting that the T-OAE (anoxic event) was genuinely a global event,” Little said. However, while other sites were recovering from the anoxic event, the environment at Ya Ha Tinda continued to face stress. Even for small, hardy bivalves, life was tough. “One of the interesting things about the recovery [at Ya Ha Tinda] is that we actually see fewer individuals at a time when we’re supposed to be seeing community recovery,” Martindale said. The fossils suggest that the environment was undergoing local stresses that kept oxygen low, Martindale said. More research is needed to untangle why life at Ya Ha Tinda didn’t recover at the same rate as other places. Since the oceanic anoxic event was a side-effect of climate change, looking back at ancient marine communities could be a window into the potential impacts of ongoing and future climate change, said co-author Martin Aberhan. “One lesson we can learn from this study is that, on a human time scale, climate-related stresses can have very long-lasting effects, with no signs of recovery for hundred thousands of years, and that the communities before and after a climatic crises can look quite different in composition and ecological functioning,” Aberhan said.